The Piccadilly Valley welcomed the Croser family back into the Tapanappa Winery with a typical cool weather vintage of exemplary quality. The winter provided average rainfall and replenished the subsoil but from August to December very dry conditions prevailed, The Tiers Vineyard receiving just 40% of normal rain. The Tiers 1.5m section was hand harvested on the 16th of March and so unique is this small area of Chardonnay that we made the decision to bottle it separately in the glorious 2015 vintage. Hand harvested Tiers 1.5m Chardonnay grapes were destemmed, crushed and chilled to the new Willmes Merlin airbag press. The 2C free-run juice combined with the light pressings was settled briefly then racked and gravitated to French Vosges oak barriques (33% new) for a cool autumn air fermentation. As soon as the fermentation was finished the barriques were topped and the wine was left to mature on full yeast lees. In the summer the wine was clear racked off lees in preparation for bottling in mid March 2016. 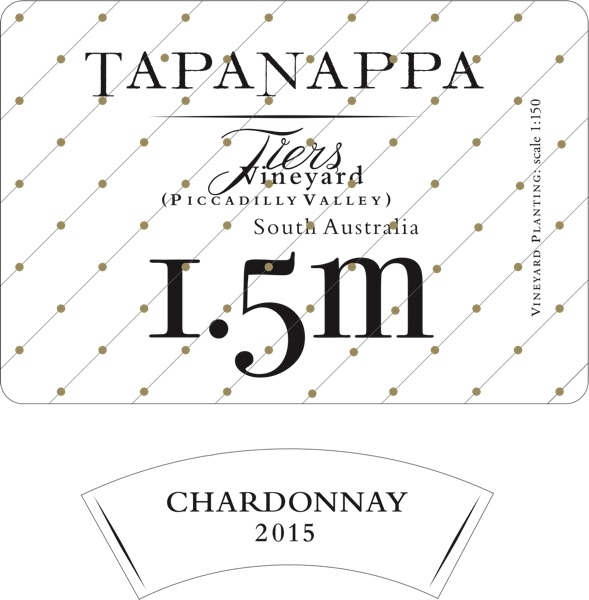 Tapanappa 2015 Tiers 1.5m Chardonnay is unmistakably a reflection of the unique terroir of The Tiers distinguished site. It has the ripe stone-fruit aroma and flavour and the significant texture of Tiers Chardonnay. Because of the precocious Bernard clones and the reflected ground warmth of the low slung 1.5m vineyard, Tiers 1.5m Chardonnay ripens earlier and more completely than the older vine Tiers Chardonnay. The texture is rich even though the natural acid provides tautness and the flavours are of luxuriant ripe Chardonnay with a slight quince finish. Bottled in March 2016. Only 200 dozen grown and made.